I started this blog to encourage women to find their inner pin-up girl. No matter their race, shape, or size. I find that it's a common fear when women first get into the pinup community and lifestyle of having their first pin-up shoot. Because they think they have to look or be a certain way or that it's going to be awkward. I decided to talk to the owner and photographer of Decadencedolls (a pinup photography studio) Autumn Luciano about how she makes sure every woman that comes into her studio look and most importantly feel glamorous. 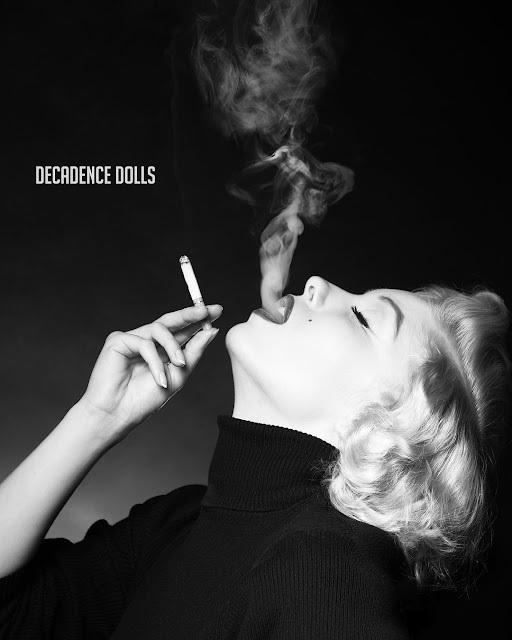 How and why did you start Decadencedolls? "I was just starting out my own portrait business when I inherited a bunch of vintage clothes, for fun I styled my friends as vintage pin-ups and took their photos. I put them online and got some requests for pin-up shoots, after that it just took over my life. " Do you get a lot of women who are nervous or camera shy that come into your studio? If so, how do you make them feel comfortable? All the time, usually just talking with them about the process helps, once they have hair and makeup done and we are going through the wardrobe to pick something out at their shoot they're already more at ease, just having spent some time with myself and the stylist. Also, I always assure them that they don't need to know anything about modeling, I handle all the posing from head to toe. By the time they've seen the first pose on the back of the camera, they are usually completely warmed up." What can women expect when they come into your studio? "To have a fun day being glammed up, feeling like a bombshell, and leaving ready to tackle their next challenge. When they return for their portrait reveal most ladies get to see themselves in a way they never thought they would, and that's really the best part of my job." What do you have to say to women who think they have to look a certain way to have a pinup shoot? "I hear all the time that women believe they are not photogenic, and I've yet to photograph anyone who was right about that. There is no such thing as being photogenic. It's all about having the right photographer, stylist, and just enough self-confidence to get yourself in front of a camera, let your creative team handle the rest. Pin-ups come in all shapes, sizes, ages. It doesn't matter if you're covered in tattoos if you don't believe you're tan enough, thin enough, or young enough, There is only one person in existence keeping you from feeling gorgeous, and that's you. Get out of your own way and go make magic happen."